It’s true that hiring slows down during the holidays. Think about it, all work kind of slows down this time of year. This is equally true, by the way, for job searching in general. December has always been the slowest month at ResumeWriters.com. I guess people have other things on their mind this time of year and they put off certain activities until they have more time to focus. January is the busiest month for hiring and job searching. If you begin the process now, you can get in ahead of the rush. The holidays are a great time to network. Think of all the office parties and holiday parties in general you’re going to attend. This is probably the most social time of year for interacting with big groups of co-workers and friends. Use this time wisely to get your name and job search goals out there. The holiday season is a key time for temporary workers. If you need a job now because you need money fast, consider temping. In certain industries, temp jobs are plentiful, and you never know, it could always turn into something permanent. Even if there are less jobs posted this time of year, the ones that are posted are probably sorely needed, high priority positions. If, like you, the employer can’t wait until the new year to fill a vacancy, that probably means you can get hired right away. Even if you have a hard time scheduling an interview in December, that doesn’t mean you shouldn’t get on the schedule. If you can line up an interview for your dream job now, don’t sweat about waiting a month. A scheduled interview is better than nothing. In short, I admit that December is the toughest month for job search. But for Peet’s sake, that doesn’t mean you shouldn’t try! In fact, for all the reasons listed above, job searching during the holidays can be to your advantage strategically. While everyone else is slacking off, you can be kicking your job search into high gear. If you have questions about employment law relating to your last job, our attorney search will put you in contact with a lawyer who can help! Our discrimination lawyers will help you recover damanges from a past employer. Pingback: Job Search: Build a Career, Job Listings, Employment » Ask Brian - Job Search During the Holidays? I think job seekers should probably stick it out through the holidays, and it might even be a good time to get your resume out. That way it will be at the top of the pile when recruiters resume hiring in January. The problem is that a lot of the time there won’t be a lot of job openings to apply for. You do a great job of analyzing the situation and I think your advice to keep on truckin’ is really good. I’ve actually had great luck job searching during the holidays. I really feel like it’s a case of, there’s less competition. every time ive taken a temp job, i went on to get hired full time. last time was last christmas. 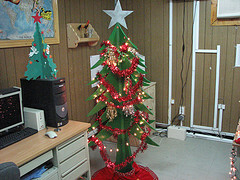 I agree that the Holiday Season is a gold rush for job seekers (as I wrote on The Daily Machete: http://machete.wildjobsafari.com/2007/11/28/adding-value-holiday-season-gold-rush.aspx). Many companies run their fiscal years concurrent with the calendar year. That means a lot of interviewing will be done now so they can bring new employees on board in January when they have a fresh batch of funds. Put the pedal to the metal, friends! There’s jobs to be gotten! Of course this is a good time of year to find a job. Some companies have hiring budgets to use up or lose, others will hire in a month and you have already introduced yourself. Some HR and hiring managers may be difficult to find, end of year meetings, but they likely have time to speak and/or meet with you. Do the opposite of what others are doing and you will get noticed. Please indicate “Fact” or “Fiction” for each of the statements below. 1. There is less competition for jobs in December. January! Many job seekers get offers they wouldn’t ordinarily get by looking in December. 2. There are only a few positions open in December. year but they have fewer candidates. There may also be pressure to exhaust this year’s hiring budget. 3. January is the strongest hiring month of the year. Fact. According to the Bureau of Labor Statistics, January is the strongest hiring month of the year. to snag the first-of-the-year positions. 4. Hiring managers are too busy during the holidays to do interviews. Year. Managers could also have tips of positions that will open after the first of the year. 5. Calls to potential employers are not welcome during the holidays. halls or taking longer lunch breaks. 6. Holiday parties are great places to get job leads. to mention your contact’s name in the initial call. Appearing desperate is a downer for everybody. Engage in some relaxed conversation about job openings. 7. Sending Holiday greeting cards is a waste of time. your name in front of more people, possibly some that you will see at holiday parties. 8. December is a good month to take time off from a job search. Fiction. The prevailing concept is that companies don’t hire during the holidays. Fact: they do!! Taking yourself out of the game shrinks the pool of candidates and gives someone else the edge. 9. Traveling during the holidays stops a job search. ahead of time to set up visits? 10. Taking a temporary holiday job is a bad idea.